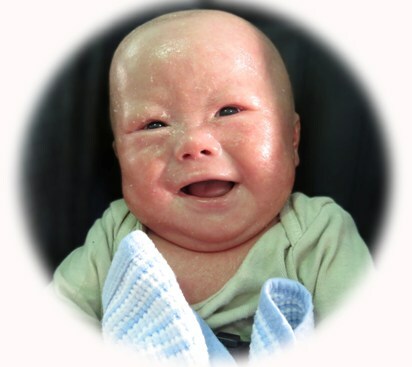 In 2014, the Saylor family of Pennsylvania adopted a baby boy affected with harlequin ichthyosis. Their journey, from the very first moment they met Daniel to today, where the happy one-year-old is making strides in his development, has been nothing less than amazing. We are excited to share the remarkable story of this kind and loving family, and delighted that they have connected with the FIRST community. Mark and I first heard the word "ichthyosis" on July 17, 2014. 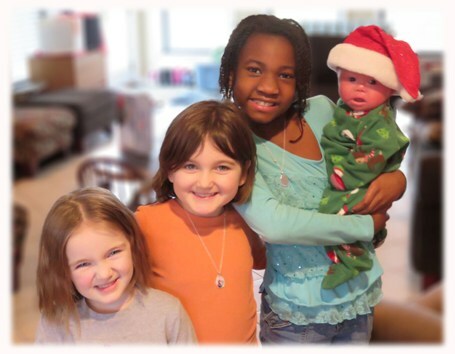 About six months earlier, we had felt the call to adopt again. We had discovered there was a need for families who are willing to adopt infants with serious, even fatal, medical conditions. We felt that this was the perfect way to blend our desire to "look after orphans...in their distress" (James 1:27) with our desire for another child. We completed the mounds of paperwork, received our approval, and had only been waiting for a few weeks when we came across a Facebook post describing an infant boy in California with a "potentially life-threatening skin disorder." When we requested more information, we learned that this baby with harlequin ichthyosis (HI) was almost ready to be discharged from the hospital, so we needed to decide quickly. We prayed, we researched (Blessed By Brenna and FIRST were both very helpful resources! ), and we said "yes!" On Tuesday, July 22, we received a call from California saying we had been "chosen" and could one of us get to California tommorrow?! After a flurry of reservations, babysitting arrangements, and appointment cancellations, I boarded a plane to Los Angeles. After a harrowing rush-hour cab ride from LAX, I walked nervously down the hospital hallway, bursting with excitement at the thought of meeting my new son. I heard little whispers of, “She’s here! The mom from Pennsylvania…she’s here!” as I passed the nurses’ station. Someone told me to don a gown and gloves, and I smiled awkwardly at the two Asian women in the hospital room, wondering which one was my son’s first mom. I peered over the edge of the hospital crib and cried as I took in my beautiful baby boy dressed only in a diaper. He was covered in dark patches of thick skin, sleeping with his eyes open, and he was making those familiar baby squeaks as he stretched. Over the next week, I sat in on all the “rounds,” learned about his medical care, signed several stacks of paperwork, and began the process of bonding with my baby boy. We decided on his name and the nurse changed the name tag on the crib from “Baby Boy Z…” to “Daniel.” Daniel means “God is my judge,” a sentiment that will be useful for Daniel as he grows up with ichthyosis. That first week in the hospital, I talked on the phone with Courtney Westlake, whose daughter Brenna is affected with HI, and Hunter Steinitz, who is also affected with HI. They were both so helpful to us. Courtney gave little tips such as how to help loosen and remove those stubborn head scales that were the source of Daniel's "malodorous" state. She directed me to FIRST, to the Fasciano family, whose son Evan is also affected with HI, to Carly Findlay’s Ichthyosis Awareness Month project, and to the Steinitz family. Hunter Steinitz answered my phone call so cheerfully and showed me that this fragile newborn in my lap might some day be a bubbly college student with a bright future. One year old, Daniel is making strides in his development (rolling over, sitting unassisted, self-feeding little crackers) and entertaining us with his cute and silly personality. We have developed a “new normal,” integrating Daniel’s feedings, skin care, and doctor appointments into the family routine. There have been a few hospitalizations, but overall, Daniel is surprisingly healthy. We have been surrounded by love and support from our local medical community, our family, and our church family (who came together to fund Daniel‘s entire adoption!). We consider it an honor and a privilege to have been chosen for him, and we are so grateful that he was chosen for us. If you are on Facebook, you can follow Daniel's story at facebook.com/chosenfordaniel.